GALION — The Galion Tigers baseball team was back on their home field on Wednesday, April 25 to face-off against Mid-Ohio Athletic Conference rivals, the North Union Wildcats. After the two squads were unable to get their game in on Tuesday in Richwood, the ‘Cats came into Galion and edged the hosting Tigers by a final score of 2-1. North Union improved their season record to 8-4 with the victory and are now 6-3 within the conference. As for Galion, they dropped to 8-5 overall and 2-4 in league contests. The Tigers would get on the scoreboard in the bottom of the second when Clay Karnes plated Aaron Barnhart on a single. Unfortunately for the home team, that would be their only run as they finished with six hits on the day and seven runners stranded on the base path. Barnhart would be the only Galion player to finish with multiple hits, recording a single and a double on the day, in addition to scoring the sole Tigers run. Ethan Pigg, Spencer Keller and Carter Keinath all recorded singles, in addition to Karnes’ in the losing effort. For North Union, they managed just three hits off of Galion starting pitcher Kaleb Harsh on the day, all singles. Harsh worked the entire entire seven innings, walking one and striking out four. Neither one of the Wildcats runs were credited as earned runs for Harsh. Galion will look to bounce back on Thursday against another MOAC member in the visiting Buckeye Valley Barons. The homestand will continue on Friday when the Tigers host the Pleasant Spartans and again on Saturday when the Willard Crimson Flashes travel to Tiger Town. 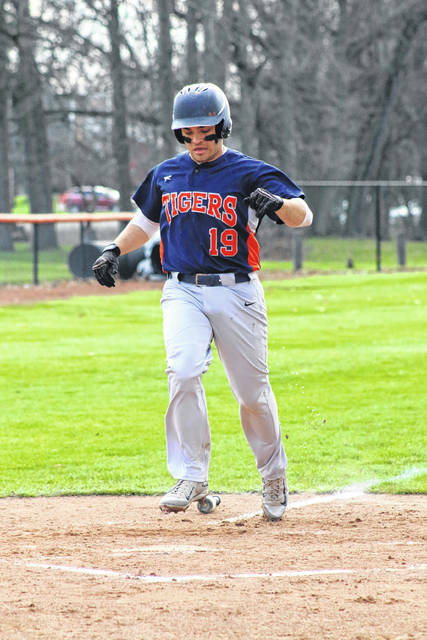 Erin Miller | Galion Inquirer The Tigers Aaron Barnhart crosses the plate for Galion’s only run in a 2-1 handed out by the North Union Wildcats. Barnhart finished the day with a single and a double at the dish for the hometown Tigers. https://www.galioninquirer.com/wp-content/uploads/sites/38/2018/04/web1_Aaron-Barnhart.jpgErin Miller | Galion Inquirer The Tigers Aaron Barnhart crosses the plate for Galion’s only run in a 2-1 handed out by the North Union Wildcats. Barnhart finished the day with a single and a double at the dish for the hometown Tigers.